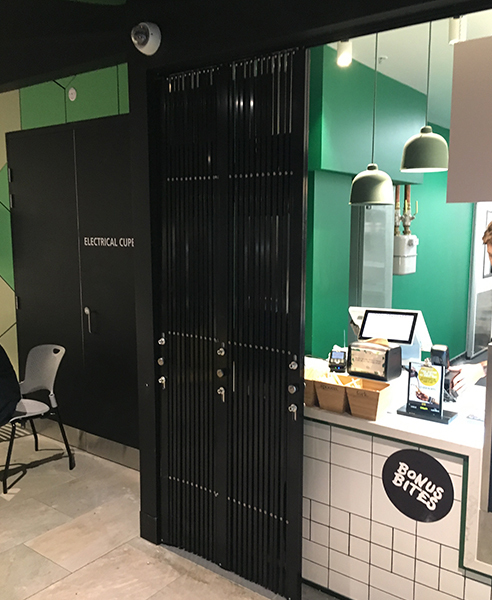 Australian Trellis Door Company (ATDC)'s premium grade security doors were recently installed at a prestigious project at Melbourne's RMIT University, (project managed by LendLease). The designers for the project, Lyons Architects, specified both ATDC's S06 heavy duty concertina security door as well as ATDC's S04-1 DD Double Diamond Mesh portable security barrier to different parts of the same project. The S06 concertina security door was specified and installed to numerous locations on this project including over the canteen area where it spanned a very wide 13-metre opening. Further, there was extremely restricted headroom due to numerous overhead services and the available daylight opening height was quite limited at 1200mm. In this application, the S06 concertina security door was ideal for a number of reasons. This door requires no headroom at all as it runs off a heavy duty extruded slimline aluminium top track (suspended by an overhead support beam). The S06 retracts and folds sideways to occupy just a negligible amount of storage room at only 15% of the overall span being secured. In fact, this door can also be set out as a parallel (side by side) top track configuration which requires only an 8% storage factor-this is known as the S07-2 model door. Moreover, by using a series of intermediate up/down locking mechanisms the client was able to achieve seamless lock up without the need for any bottom track (removable or otherwise) to the countertop area and without the need for any cumbersome and unwieldy removable mullions. For further information on ATDC's security rated folding security door, click here. In a different location on this same project, ATDC's S04-1 DD deluxe grade Double Diamond mesh portable security barrier was specified and installed to the university's rubbish bin storage and bin wash area. In this instance, this trackless product was ideal since the existence of numerous services prevented any other type of structural door system from being installed. The barrier is portable and free standing and accordingly was an ideal solution for the client. The double diamond mesh meant a very robust barrier was supplied that could withstand the considerable impact and force it is subjected to in this bin storage area. Also folding and retracting sideways on to itself resulting in only a minimal storage space requirement. And with both floor and wall mounted locking options an optimal security solution was provided. Further, the pitch between the metal cross-linkages on this door is only 65mm. This prevents anybody being able to gain a foothold and so deters persons from climbing over this door - one of its complying characteristics with the Australian Standards for Temporary Fencing and Hoarding. For further information on ATDC's double diamond barrier in other applications refer to an article here. For further information on ATDC's full range of space efficient folding security doors visit their website at www.trellisdoors.com.au. Also available for sale in Sydney, Melbourne, Brisbane, Adelaide, Perth and Canberra and across all regional towns including Newcastle, Geelong, Wollongong, Townsville, Hobart. And they are also widely available for export throughout South East Asia, The Asia Pacific, New Zealand, The Pacific Islands and the UAE.